This is a capture from all of the midwest radars from about 5:00 am this morning when migration was winding down for the night. Many birds migrate at night for several reasons. It is colder so they don't overheat as easily, they are less likely to be preyed upon and under clear night skies the stars can be use as navigational aids. 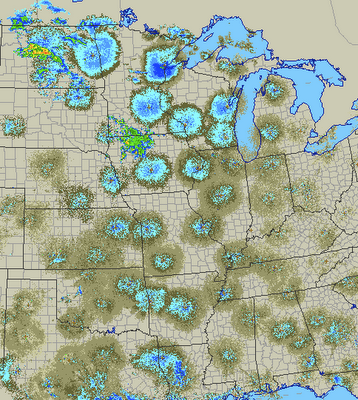 The circles on the map represent large flocks of birds migrating past doppler radar sites. There are a couple of interesting things to note. First off, the migration last night seemed to be heaviest in Minnesota, Wisconsin and North Dakota. At first I was thinking that this could be good news for bird watchers looking for new migrants. However, that explanation doesn't make sense. We haven't seen many of the migrants yet as they are still further south. 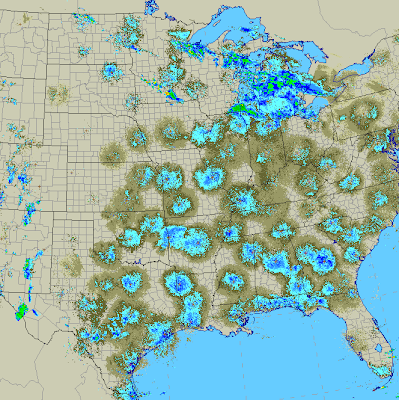 I think what we are seeing on the radar is primarily migratory waterfowl heading further north out of the states and up into Canada. it is also interesting to take a close look at the the Green Bay and Duluth radar returns. They show that the birds do not like to travel over the open water of the great lakes but rather prefer to follow the shoreline. This all stands in contrast to tonight's current radar composite which as of 9:15 pm CDT shows massive migration movements in the South Eastern US and very little in the upper midwest.